Megaupload founder Kim Dotcom has declared himself “broke”. Kim Dotcom said he had spent $10 million on legal costs since being arrested in New Zealand in 2012 and accused of internet piracy. He had employed a local law firm to fight the US’s attempt to extradite him, but his defense team stepped down two weeks ago without explaining why. Kim Dotcom said he would now represent himself at a bail hearing on November 27. He denies charges of racketeering, conspiring to commit copyright infringement and money laundering. 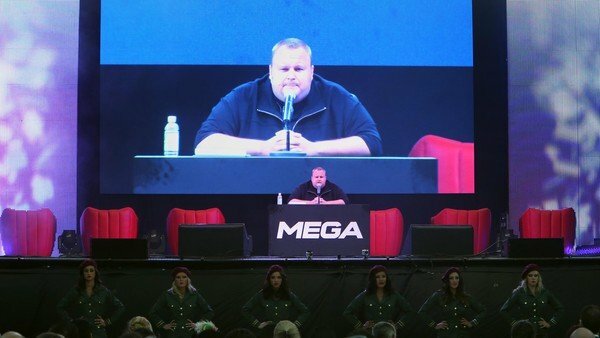 Kim Dotcom told a conference in London, via a video link, that his lawyers had resigned because he had run out of money. “The [US authorities] have certainly managed to drain my resources and dehydrate me, and without lawyers I am defenseless,” he said. Kim Dotcom’s declaration comes seven months after he won back access to about $750,000 worth of property – including several of his cars – that had been taken at the time of his arrest. However, other assets, including dozens of bank accounts, remained frozen. The German national’s finances have also been put under strain after he helped bankroll a political party that failed to win a seat in September’s general election in New Zealand. “Before I started my political movement – the Internet Party – I was quite popular in New Zealand,” Kim Dotcom told the digital business conference. “After I got involved in politics and the prime minister of New Zealand and his party attacked me viciously, labeling me a Nazi… and [saying] I’m only starting my political party to fight my extradition… New Zealanders unfortunately have bought into that narrative and today I’m a pariah. Kim Dotcom does, however, continue to retain a lawyer in the US, who gave an interview to Radio New Zealand after Kim Dotcom’s comments. “There are assets frozen across the globe, there are mechanisms in place for getting relief from those frozen assets – we’re hopeful that courts across the globe, including in Hong Kong and New Zealand, will do the right thing and release funds to counsel,” said Ira Rothken. “This is the largest copyright case in the history of the United States and New Zealand. It’s a very expensive case. And the governments are making this a war of attrition. Ira Rothken added there were still about 20 lawyers working on the case. Kim Dotcom launched a follow-up online storage company, Mega, in 2013, and in March said it was valued at 210 million New Zealand dollars ($164 million). The business is set to be floated on New Zealand’s stock exchange later this year. However, Kim Dotcom does not directly own a stake in the business himself and is no longer one of its directors. Kim Dotcom’s wife, Mona, does own 16.2% of its shares, but the two are separated. Mona Dotcom revealed in June that she had moved into a guest house about 165ft away from Kim Dotcom’s mansion so their five children could still be close to their father. Kim Dotcom has revealed that his rent is pre-paid until mid-2015 and he plans to return to court “soon” to try to unfreeze more of his assets. The next extradition hearing into his case is not scheduled until February 2015, providing him an opportunity to hire more local lawyers if he can obtain the funds. The US Justice Department claims Megaupload made more than $175 million before it was closed and cost film, TV and other rights-holders more than $500 million.